Fred Travels, Mumbai is one of the most efficient Inbound Tourist Handling Agency in Mumbai & Goa. They handle individual and large groups not only in Mumbai, but also all over Maharashtra, Goa and parts of Southern India. When it comes to inbound tours, you can rely on Fred Travels, as this organization is anchored by high values and driven by a highly motivated team to give you an excellent experience of various services. They provide a distinguished fleet of various vehicles, like Innovas, Audis, Mercs, BMWs, Plus Tempo Traveler, Mini Coaches & Large Coaches, along with trained chauffeurs; various recognition certificates from IATO, TAAI and TAFI and Government of India’s TTO, Fred promises remarkably effortless services – the best in the industry! 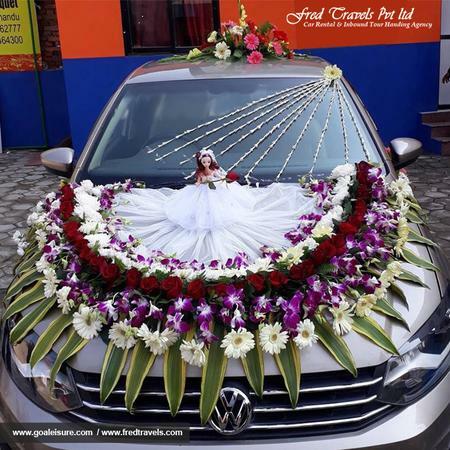 Fred Travels Pvt Ltd is a luxury car rental wedding based out of Worli, Mumbai . Fred Travels Pvt Ltd's telephone number is 76-66-77-88-99, Fred Travels Pvt Ltd website address is http://www.fredtravels.com/, Facebook page is Fred Travels Pvt Ltd and address is RF 4, Kakad Chambers Annexe, Annie Besant Road, Adjacent Poddar Hospital, Worli, Mumbai, Maharashtra 400018. In terms of pricing Fred Travels Pvt Ltd offers various packages starting at Rs 4000/-. There are 0 albums here at Weddingz -- suggest you have a look. Call weddingz.in to book Fred Travels Pvt Ltd at guaranteed prices and with peace of mind.